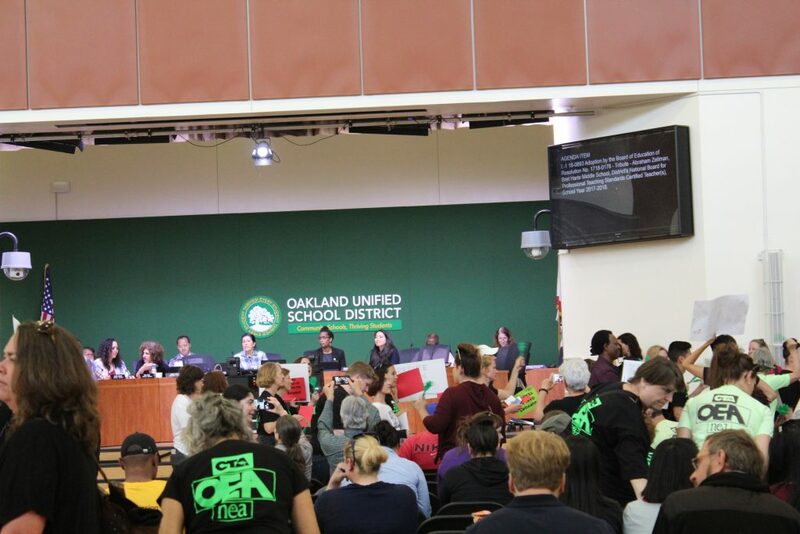 Teachers threaten to strike at Oakland school board meeting on May 9, 2018. 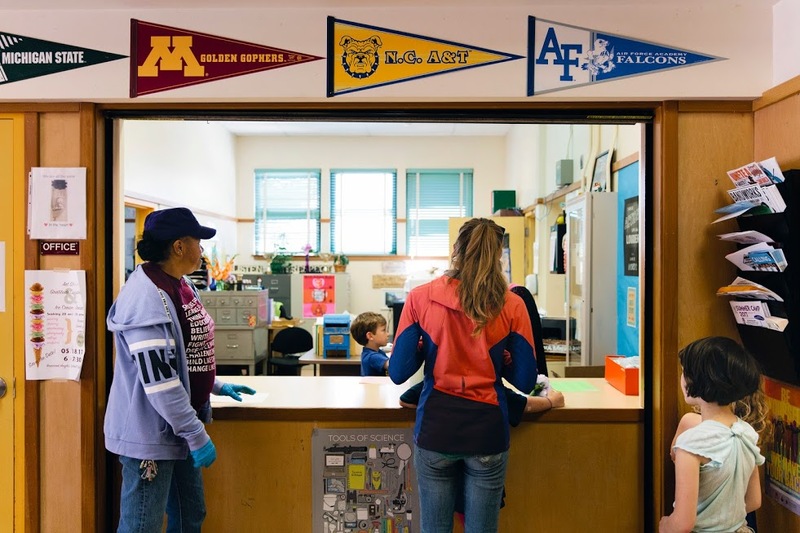 Some school districts across California — including Oakland Unified in the Bay Area — are facing deficit budgets along with demands from teachers for higher salaries and improved classroom conditions. The result is tense contract negotiations that in some districts could lead to teachers striking when school resumes in the fall. Statewide, this group includes Los Angeles Unified and the Evergreen School District in San Jose, which are having trouble negotiating new contracts, according to the California Teachers Association, with which most district teachers’ unions in the state are affiliated. Inglewood Unified in Los Angeles County has a deal with its teachers, but is banking on the state’s help. Three other districts recently negotiated contracts for this year and are continuing talks for next year: Fremont Unified, Alameda Unified and National City Elementary in San Diego County. “We are seeing some turmoil in several districts that are refusing to make investing in teachers a top priority at the bargaining table,” said Mike Myslinski, a California Teachers Association spokesman. Some of these districts will receive more in state aid next year to educate low-income students, English learners, foster youth and homeless children. Yet, they are also planning budget cuts because the extra money won’t be enough to balance their budgets. Care about East Bay schools? As state revenues flatten over the next three years, while costs continue to rise, Oakland will not be the only district that will have difficulty paying its bills, said Michael Fine, CEO of the Fiscal Crisis and Management Assistance Team, or FCMAT, a state agency that works with districts on financial issues. “I think districts across the state are either making reductions or gearing up to make reductions,” he said, noting that districts plan three-year budgets and that even though they expect more state aid next year, expenses are going up faster than revenues. Oakland Unified faces unique problems, including a fiscal crisis that requires at least $5.8 million in budget cuts for next year on top of $9 million the district said it cut this year from its $552.4 million budget. (A recently released analysis by FCMAT says the district could not fully substantiate whether those cuts were made. The agency concluded that the district is in “financial distress,” in part because of its practice of dipping into reserves to cover costs.) District officials estimate the budget deficit will be $20 million next year and will grow to $60 million the following year unless cuts are made. Even with those cuts, the district’s deficit next year will be an estimated $14.2 million. Oakland’s labor dispute is happening against the background of decades of budget problems, as well as turnover in district leadership. In 2003, the district received a $100 million state bailout loan, which it is still paying off. It has a state trustee in place who is supposed to oversee the district’s spending and who has veto authority over its financial decisions. A fiscal report by FCMAT last summer pointed to multiple reasons for Oakland’s budget travails, including exceedingly high special education costs, loss of funds due to thousands of students attending charter schools and poor financial management by district leaders. Included in the blame was former Superintendent Antwan Wilson, who left the district two years ago after less than three years in his post to head up the school system in Washington, D.C. The report noted that he “rushed new unfunded positions through the process without regard to budget appropriation” and that school sites were allowed to “ignore and override board policies by spending beyond their budgets” under his leadership. The district’s budget crisis occurred despite the fact that the district has received additional state dollars since the 2007 recession, and that the district’s spending per student has increased from $11,051 in 2012-13 to $14,835 in 2016-17. Meanwhile, the district’s teachers’ union has tried to negotiate a new contract to replace one that expired last July. The last contract agreement, reached May 13, 2015 for July 1, 2014 through June 30, 2017, provided teachers with a 2 percent raise in 2014, followed by a 1 percent raise Feb. 1, 2015 and a 2.5 percent raise on June 30, 2015. The agreement also projected additional pay increases in 2015 and 2016, which were expected to bring total ongoing increases over 18 months to 13.95 percent, plus a one-time payment of about 3.32 percent in October, 2015. In the most recent negotiations, union leaders say talks broke down last month, prompting them to declare impasse and request mediation from the state’s Public Employment Relations Board, or PERB, which has been granted. Over the past three years, the number of districts asking for mediation in bargaining talks with teachers rose from 120 in 2014-15 to 182 last year, said John Gray, president of School Services of California, which advises school districts on budgets. And impasse declarations resulting in the assignment of mediators approved by the state increased from 91 in 2014-15 to 103 last year. The state personnel board approved fact-finding, the next step after unsuccessful mediation, 32 times last year, up from up from 23 in 2014-15. Fine from FCMAT pointed out that Inglewood Unified, which is under the control of a state-appointed administrator and — like Oakland Unified, is paying back a state loan — is also in fiscal distress. That district reached a tentative agreement with its teachers’ union that is contingent on at least $4 million a year in state budget relief, which it has not yet received. If it doesn’t get that money, teachers there have said they would strike in the fall. Oakland Education Association teachers’ union members threaten to strike due to stalled negotiations at May 9, 2018 school board meeting. 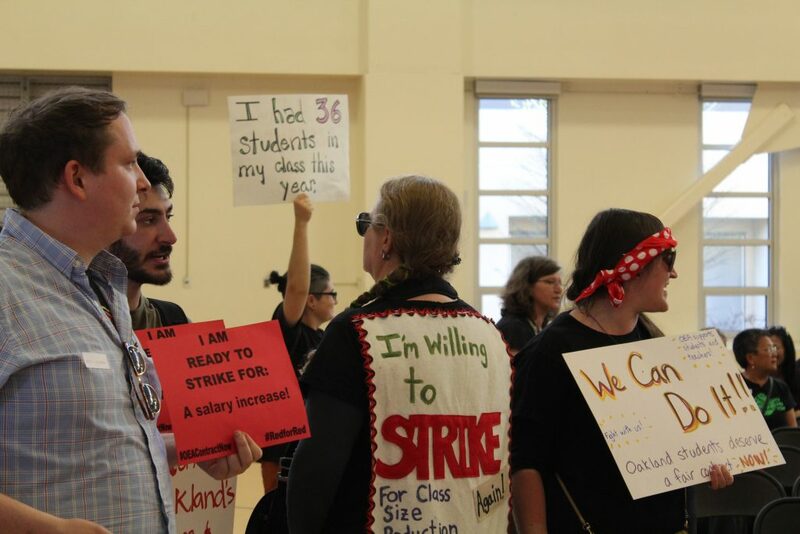 Teachers in Oakland Unified also say they may strike in the fall if the district doesn’t meet their demands for pay hikes, smaller class sizes and, for some, more preparation time. Superintendent Kyla Johnson-Trammell declined to comment on the teachers’ demands. Regarding the district’s financial woes, Johnson-Trammell said Oakland Unified may have to make “draconian cuts that would hurt all students in our city” to balance its budget. Although the teachers’ union acknowledges the district’s budget crunch, it claims the district doesn’t spend its money wisely. 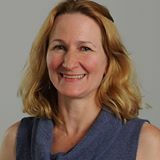 “We think they could reprioritize the budget they have,” said Trish Gorham, president of the teachers’ union, Oakland Education Association, noting that educators are feeling a sense of solidarity with others around the country that have walked picket lines for more money. Those efforts inspired California teachers’ unions, including the Oakland Education Association, to host a forum earlier this month with teachers from Arizona, Kentucky and West Virginia discussing their organizing efforts, strikes and victories. Keith Brown, president-elect of the Oakland teachers’ union, told those gathered that their efforts are part of a larger statewide and nationwide movement. “We know that it takes collective power from the ground up to win — to have the schools that our students deserve,” he said, adding that Oakland teachers must also involve parents and the rest of the community to fight for better teacher pay, lower class sizes and extra supports for the district’s neediest students. The panelists also helped him understand the importance of “building power” at school sites and escalating actions from smaller rallies to a potential strike, he said. In California, unions in individual districts negotiate contracts, which leads to wide variations in pay and benefits from one district to another. 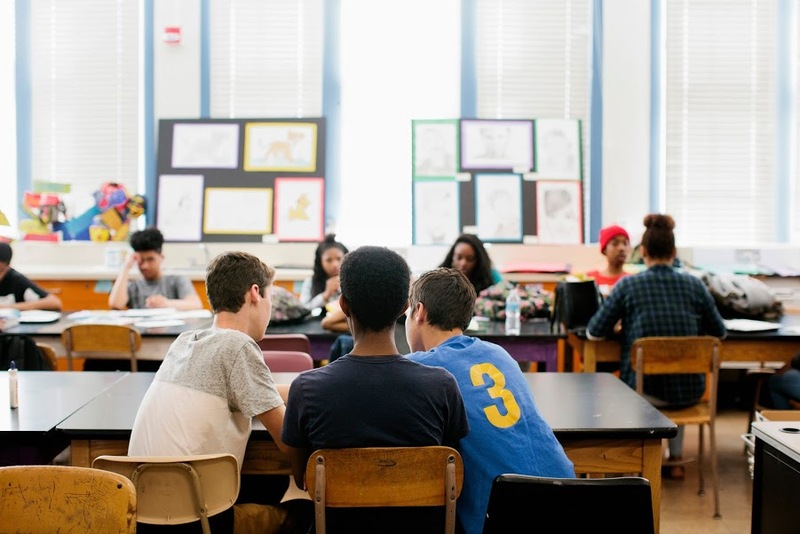 Oakland ranked 22nd among 101 Bay Area districts for its 2016-17 entry-level teacher salary, but much lower for its salaries for experienced teachers, state data show. Among districts that submitted salary data to the California Department of Education for 2016-17 in six Bay Area counties, Oakland Unified reported an entry-level salary of $46,411. 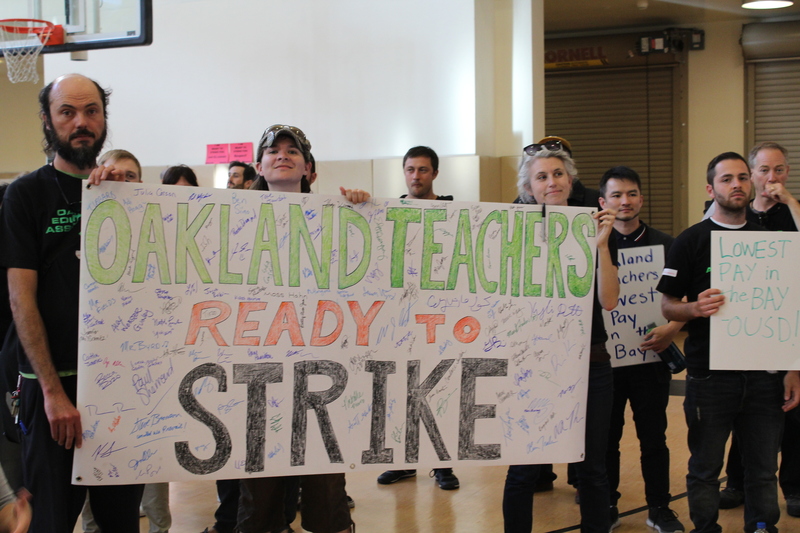 For teachers with 10 years experience and an additional 60 units of educational credits, Oakland reported a salary of $63,904, which ranked fifth from the bottom. Similarly, Oakland’s top salary of $83,437 ranked 6th from the bottom. Oakland Education Association union members crowd into Oakland Unified school board meeting on May 9, 2018 to demand pay hikes. Teachers turned up the heat on the district before last month’s negotiations by marching through the streets of Oakland carrying signs demanding pay increases, then protesting at the May 9 school board meeting, chanting slogans such as “Where did all the money go?” This was referring to about $20 million in increased revenues through the state’s Local Control Funding Formula, which gives districts extra funds to educate low-income students, English learners, foster youth and homeless children. It also gives school districts greater freedom on how to spend those funds. Earlier, at a union rally before the meeting, some teachers spoke about why they are ready to strike. Mayra Alvarado, 28, a second-year teacher, said the district should pay teachers enough money to rent or own homes in the community, which is one of the most expensive in the state. In Oakland Unified, a second-year teacher with no added educational credits is paid $47, 311 per year. 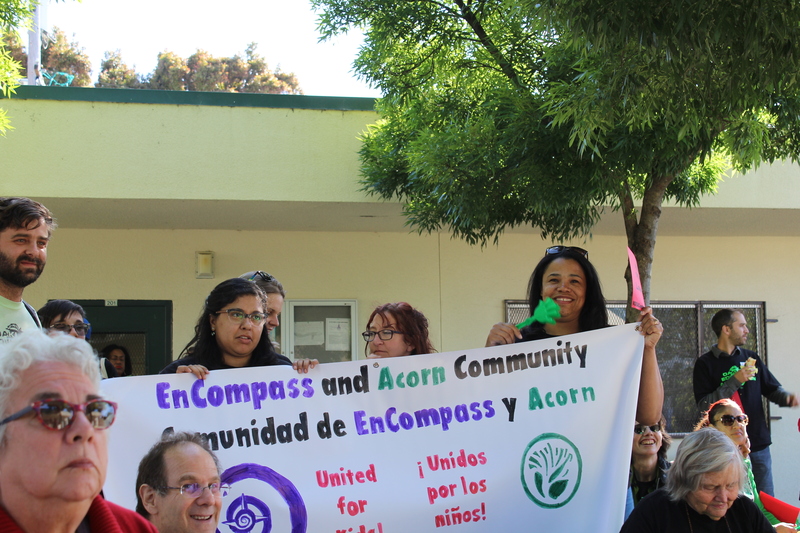 Teacher Mayra Alvarado (holding left side of sign above “EmCompass”), told union members during a May 9 rally that she doesn’t make enough money to rent or purchase a home in Oakland. To help retain the 300 to 500 teachers expected to leave annually to go to other districts, retire or leave the profession, the union in Oakland is asking for a 3 percent retroactive pay raise this year, 4 percent in 2018-19 and 5 percent in 2019-20, which would cost $6 million this year, then $14 million to $20.6 million next year and $24 million to $36.6 million in 2019-20, depending on the seniority levels of teachers who remain. 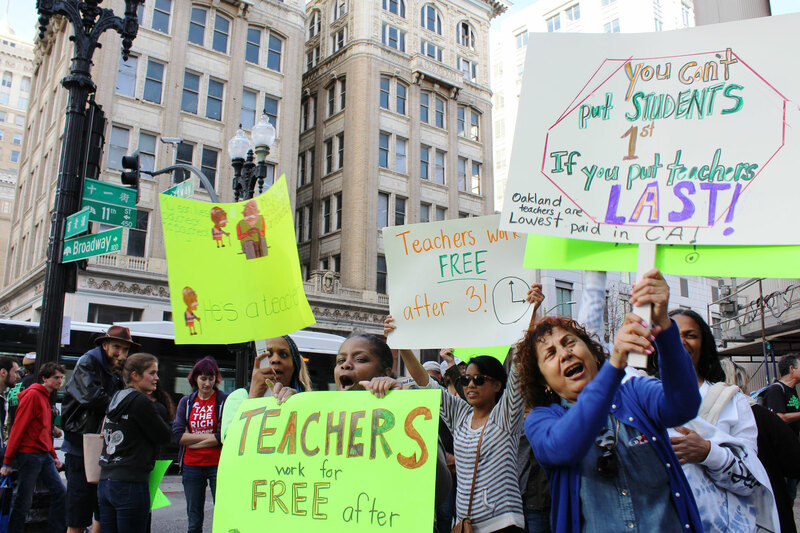 But Oakland Unified can’t afford to meet teachers’ demands, given its budget constraints, said Christopher Learned,the district’s state-appointed trustee. “I would not allow the district to agree to it,” Learned said of teachers’ pay demands in April. Instead, the district has offered a 2 percent bonus by November, 2018, followed by another 2 percent bonus by November, 2019. About 1 percent of that would be an ongoing annual salary increase. “We are far apart,” said Dennis Nelson, the union’s chief negotiator, noting that the district offered no salary increase in the 2017-18 school year. John Green, a regional California Teachers Association staff member who works with the Oakland union, called the district’s offer “mind-bogglingly bad,” adding that the district is asking teachers to do more, by increasing class sizes and extending work hours, which would equate to pay cuts, even with proposed salary increases. “It’s going to be really bad for recruitment and retention in Oakland if we can’t fix this,” Green said. The district and union will begin mediation in August. I hope that other districts do not follow the lead of San Diego Unified, which has followed CTA’s suggestion “to make investing in teachers a top priority at the bargaining table”–and has had to make deep cuts to student programs and services to pay for these raises. According to the district’s Powerpoint presentations on their budgets, the district now spends 97% of its budget on employee salaries and benefits in a budget that balances only by including one-time funding (creating budget deficits in future years). SDUSD now has almost no funding to pay for anything else, like textbooks, student transportation, IT support (meaning the technology the district invested in sits inoperable for months waiting for repair), Visual and Performing Arts, Gifted and Talented Education, school site services (such as school libraries), etc. While the teachers’ collective bargaining units and CTA push for higher wages, who is looking out for the students? School districts are not able to create more revenue; the amount is fixed by the state (or, if you’re lucky enough to live in an affluent area, the property values). So let’s be honest: Increasing costs for employees actually reduces the funding available to provide for students’ needs, such professional development for better instruction and the funding for additional resources for at-risk students (including more instructional support personnel and lowering the student-teacher ratio). No one is entitled to live in the city they work, and no employer owes you, or anyone else, a salary that allows for such. And $47K for the 2nd year on the job, plus another $40K in benefits, plus bullet proof job security for a part time 37 week work year is pretty dame good. Far better than any other profession out there n the private sector, including professionals with 3-10 years of graduate school under their belt. This problem is bigger than Oakland or Inglewood and way beyond Janus. If we want great schools let’s treat and compensate teachers as we do other professions. Yes this will mean higher expectations, longer working days and a longer school year. Our children’s future are worth whatever it takes. One of the best articles I’ve seen about OUSD financial problems. Especially appreciate your not avoiding looking at the numbers. One comment, is that when talking about teacher compensation you move interchangably between gross salary and total compensation including benefits. I’m sure it’s hard to adjust for things like prep time, but would be very helpful to know where OUSD teacher total compensation stands relative to other districts. Also would be helpful to know the same for OUSD administrators, as well as the ratios of admininstrators and other central admin costs as compared to other similar demographic school districts. Regardless if the Janus ruling is unfavorable or favorable to unions, this nonsense will end. 2003 – bankrupt, $100 million bailout and state takeover. 2018 – bankrupt again with no reasonable plan for fiscal health. FCMAT’s measured tones notwithstanding, district officials continue corrupt spending policies. Amidst all this financial turmoil, the neglect of thousands of students. This doesn’t even resemble a system of public education. 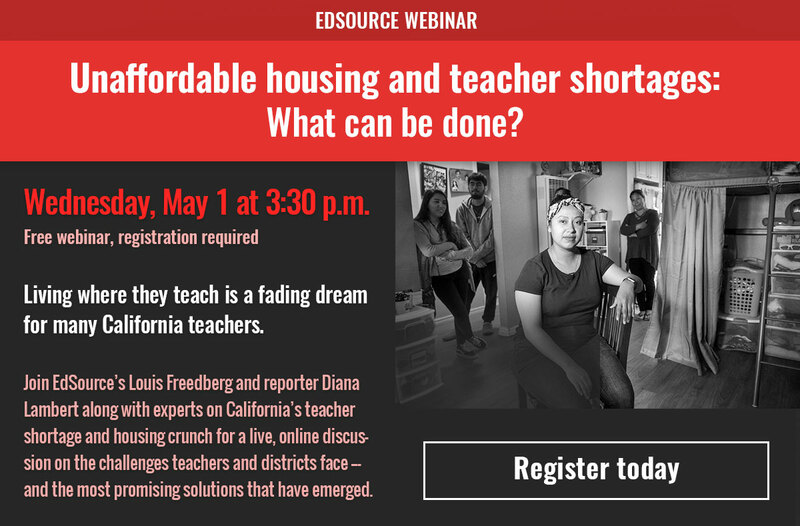 It is now nothing more than a failed accounting exercise and someone – perhaps the editorial staff at EdSource – should have the courage to advocate for freeing these families from this corruption by calling for an end to OUSD. Janus decision can’t come soon enough. This morning? Nope. Has to be soon, though. John, Can you fix the chart so it won’t continually switch the sort. It’s impossible to read. Click the chart, Ann, and you can start sorting on your own, at your own speed.